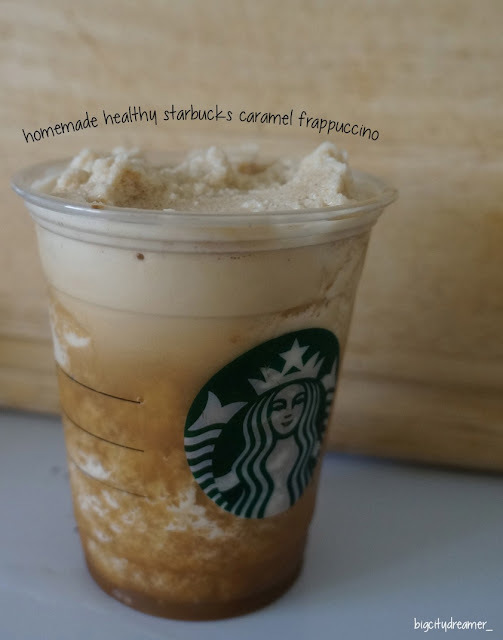 I created a tutorial last year about how to make a healthier version of Starbucks Caramel Frappuccino Light in my I Love Starbucks post! I thought I might as well put together a new post with better photos as I have plenty of opportunities; I've been having at least 2 of these drinks everyday recently! Just to emphasise, this drink costs around 10p to make; compare this to the £3.20 (in the UK) for a tall caramel frappuccino light and that's a massive saving! 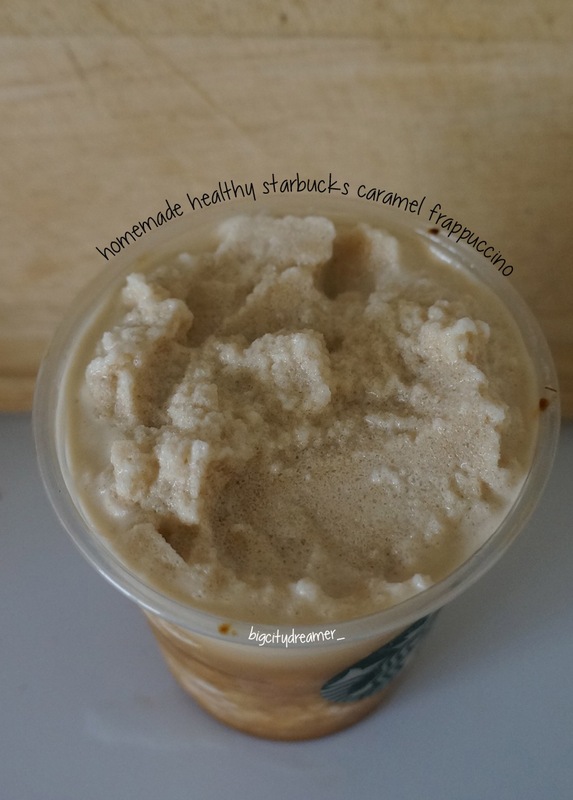 Nutrition-wise, the Starbucks (light) version contains 96 calories, 0.1g fat and 20.8g sugar where as my homemade version contains only 40 calories, 0.1g fat (depending of course on the milk you use) and 9g sugar. Now, don't think I'm trying to put you all off Starbucks! I absolutely love going to get my drink and sitting in for a few hours working on my blog or uni work or people watching; I'm just giving you a healthier, cheaper version. Place 2/3 cup of ice in a blender. Add 1 heaped tsp coffee (I use decaff) and 2/5 cup water. Add milk to taste along with 2tsp caramel syrup*. Pulse in the blender for 30 seconds. Top with caramel sauce if desired! *For a healthier version, sub the caramel syrup for 1/2 a frozen banana; the consistency maintains it's smoothness and you'll be on your way to 5-a-day! With the banana, the calories and fat content stay the same but the sugar content drops to 4g. Of course, you can use different flavoured syrups for different frappuccinos! What is your favourite Starbucks drink? Do you have a Starbucks nearby? You worked admirably and I am especially eager to break down everything at alone place. I am genuinely thriving concious. Also, along these lines I everything considered check for new substance having most recent flourishing related tips, by and large some Juicer Magazine targets give stores of data on this respect. In the event that you ever need to take a touch of your stack off, I may be an OK help to frame for you on the referenced issue.